Christmas is one of those occasions when the power of tradition is strong and of course the arguments as to what is right when it comes to Christmas traditions is never ending. Does Father Christmas wrap presents? Is Father Christmas called Father Christmas or Santa Claus? One of my personal favourites – the one that really gives everybody else the heebie jeebies – is having real candles on the Christmas tree. But at least we’re not like those poor, deluded souls on the Continent, who are sadly deprived of massive over-indulgence in dried fruit related foods; and in particular, no Christmas pudding means no excited searching for the little trinket. However, the French – obviously having decided that this game is an essential part of Christmas, have their own take on the custom. 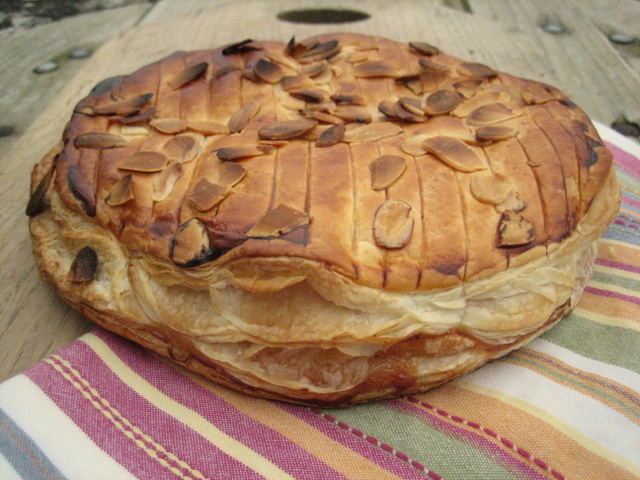 This Sunday is Epiphany, which means that it’s the time for a Galette des Rois – a Kings’ cake. After having had a go at the Spanish Rosca de Reyes the other day, I thought that I should have a go at it’s French cousin, with which I was more au fait. 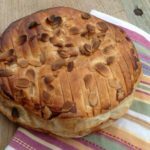 If you try this Recipe: Galette des Rois please tag #FussFreeFlavours on Instagram or Twitter. It is amazing for me when for me when you make one of my recipes and I really do love to see them. You can also share it on my Facebook page. Please pin this recipe to Pinterest too! Thanks for reading Fuss Free Flavours! 1 egg and a tablespoon of milk for an egg wash.
Preheat the oven to 200C/390F/Gas Mark 6. Unroll the pastry, and find a plate which you can use as a guide to cut two circles of pastry – not too big – I used a side plate. Cream the butter and sugar together, add the almonds, 1 egg and almond extract and mix to a smooth paste. Lay out one of your pastry circles on a sheet of greaseproof paper on a baking sheet, and spread the jam in a circle in the centre. Allow enough space around the edge to seal on the top layer. Cover the jam with the frangipane, and sprinkle on the flaked almonds – they add a crunch. If you have one, hide your trinket at this point. Cover with the second layer of pastry, using a little water to seal the edges. Make sure the top layer is well crimped on, to stop any leakage. Using a knife, score a pattern on the top. Brush the top with the remaining egg, beaten with the milk. Place in the oven, and bake for about 30 minutes, until golden brown.